For centuries, Europeans and North Americans have been giving gifts around Christmastime. 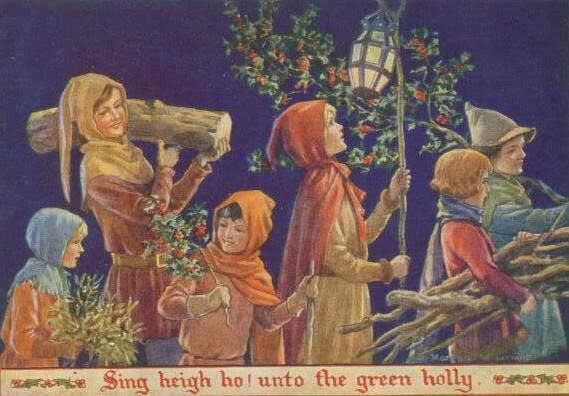 Image: Ancient Britons carrying a Yule log and holly branches. Source: From the bottom of the barrel blog. The practice dates to the pagan and druid peoples of Rome, the British Isles and Scandinavian countries. The Romans gave gifts or money for gift-giving at Saturnalia, a winter festival that lasted seven days; according to some sources, the gift-giving occurred on the last day of Saturnalia (December 23). When the Romans conquered Britain, they incorporated pagan religious practices into their festivals, so that the locals felt more integrated into the Roman Empire. Pagans and Druids celebrated the winter solstice festival, Yule, and although by many accounts it was not the most important pagan festival, it was celebrated quite a bit. Any visitors to the Irish Neolithic pagan monument Brú na Bóinne** are left in no doubt of that. The pagans may have given gifts at the Yule celebration as well. Christianity later took over much of Europe, and the Christians, like the Romans, learned that the best way to truly conquer was not to divide, but to incorporate. Gift-giving became a celebration of the birth of Jesus Christ, just as pagan Yule branches became “Christmas trees”. Although the pilgrims at Massachusetts formally outlawed public celebrations of Christmas for twenty-two years, the whole Christmas juggernaut eventually won out in the United States. Giving gifts at Christmastime eventually became de rigueur, even for secular and non-Christian people. American Jews in the late nineteenth century started to promote Hanukkah—a minor Jewish festival—as a time for Jewish parents to give their own children gifts, so that American Jewish children wouldn’t feel left out when their peers got gifts. And although Kwanzaa isn’t supposed to include gifts, some parents give their children gifts on Kwanzaa days. It seems that few Americans, despite their religious convictions, can resist the ritual of end-of year gift-giving and the ties the practice strengthens among us. So by now we’ve worn the stretchy pants for Thanksgiving, and powered through the mall on Black Friday. On Cyber Monday, as I write this, it’s time to get ready for some serious shopping: we’re in the middle of Hanukkah, and we’ve got a mere twenty-three days before Christmas and twenty-four days before Kwanzaa. You need to get some creative gifts, stat. For help with this goal, turn to GPO’S US Government Bookstore, especially the wallet-friendly Bargains Under $20 page—it’ll help you wipe out your stocking stuffer list in a red-hot minute. That said, here are 12 solid suggestions for your holiday gift-giving, no matter what holiday you’re celebrating at this time of year! You need to get something small to give your little ones as well as the big presents, and it encourages your kids to read more if you give books as gifts. Fire trucks nearly always captivate the pre-K set: show them a picture of a fire truck, complete with cute Dalmatian, and their attention is rapt. Marty and Jett’s Activity Book: Let’s Have Fun with Fire Safety (US $5.00 includes FREE shipping) activity book comes with cutouts for junior fire badges and finger puppets, coloring pages, a maze, and a fill-in-the-blanks puzzle. There’s a list of important things for kids to remember in a fire. Most schools now include this information in their curriculum, so the book is a good reinforcement of that learning—and it’s also a coloring book. This little volume’s a slam-dunk: educational and amusing, all in one cute package. Is your child or grandchild a fan of Jurassic Park or Dinosaur Train? Then be sure to pick up the National Park Service’s Junior Paleontologist Activity Book, Ages 5-12, Explore, Learn, Protect Activity Book (US $6.00 includes FREE shipping) in which kids can learn about dinosaurs, explore some of the US national parks that offer you a look into this ancient past, and complete fun activities that will let them earn a junior paleontologist badge. For busy parents who want to make healthy meal preparation a family affair, Keep the Beat™ Recipes: Deliciously Healthy Family Meals (ON SALE US $10.50 includes FREE shipping) is a delightful kid-friendly healthy cookbook developed by a single father and nutritionists that features delicious, heart-healthy, kid-friendly recipes and also provides tips for involving children in meal preparation. The appendix is loaded with information on meal planning, cooking, and nutrition for families and children to help combat obesity and diabetes. With an 85-year-old war Korean War veteran from America currently detained in North Korea while on a tourist trip, this new eBook from the CIA is very timely. Before North Korean forces invaded the South on 25 June 1950, the CIA had only a few officers in Korea, and none reported to the CIA’s analytic arm, the Office of Research and Estimates (ORE). With an accompanying DVD that contains over 1,300 recently declassified documents and more than 5,000 pages of material, this Baptism by Fire, CIA Analysis of the Korean War multimedia book-and-DVD set (US $18.00 includes FREE shipping) sums up the analysis by the then only 3-year old Central Intelligence Agency about the Korean Conflict and the generally low priority given the region by the Truman Administration’s State Department and the US Armed Forces. The evolution of digital information and communication technologies have developed to such a point that terrorists can film, edit, and upload their own attacks to Twitter, Facebook, YouTube and other websites within minutes of staging them, whether the Western media are present or not. In this radically new information environment, the enemy no longer depends on traditional media. This is the “YouTube War.” The new book YouTube War: Fighting in a World of Cameras in Every Cell Phone and Photoshop on Every Computer (US $16.00 includes FREE shipping) lays out the nature of the new digital and online media environment in terms of its implications for a war against media-savvy insurgents, and then considers possible courses of action for the Army and the U.S. military. Crossing Cultures with the Peace Corps: Peace Corps Letters from the Field (US $17.00 includes FREE shipping) is a great offering for a school or college student, a teacher, a newly or soon-to-retire person, or someone who likes reading about other cultures. Although the authors structured the book for use in schools, and includes lesson plans at the end of each letter, reading the letters is good entertainment for anyone. You can learn things about Togolese family life, Chinese average salaries, South African attitudes about AIDs, and the native tongue of Paraguay, Guaraní. Studying cultural attitudes of other societies always makes you appreciate your own society, and it may even make you want to learn more about others. This book will make you reflect on what you value, even while you walk away with some good talking points for your next party. The First Ladies (US $17.00 includes FREE shipping) is the perfect book for the history buff, art historian, costume designer or fashionista in your family. Each page features a biography of every first lady, and her official portrait in full color on the facing page. You can read the accomplishments and tribulations of each FLOTUS (First Lady of the United States) from Martha Washington through Laura Bush, watch the trends in ladies’ dress and portraiture change, and learn some interesting tidbits of American historical trivia. This book was my favorite Christmas gift when I was twelve, and the passage of time since then makes it nearly a classic today. National Wildlife Refuge System: A Visitor’s Guide (US $5.00 includes FREE shipping) The U.S. Fish and Wildlife Service manages a “…diverse system of 500+ refuges encompassing almost 92 million acres of lands and waters spans the continent from Alaska’s Arctic tundra to the tropical forests in Florida; from the secluded atolls of Hawaii to the moose- trodden bogs of Maine.” Most of the book is composed of full-color maps. You can plan your next trip with the help of these maps, either for a weekend or a full two-week blowout in summer. This print edition is back-pocket friendly for a day out on the trail. How to Prune Trees (ON SALE US $2.00 includes FREE shipping) is a great gift for any homeowner. While some may think pruning trees is quite simple, you actually have to know when to trim a tree, in what weather to trim it, and why you would trim a tree, etc. Pruning is a fairly complicated task; if you trim a tree incorrectly, you can kill it. It costs quite a bit to buy a new tree from a nursery, and a long time to grow a new one. Investing a mere $2 in this color-illustrated guide might save you or your gift’s recipient big bucks, and after a few reads, give the satisfaction of mastering a new art. Exporters! The Wit and Wisdom of Small Business Owners Who Sell Globally (ePub eBook) (US $7.99) profiles 25 Americans who battled competitors, fear of the unknown, and personal adversity to build successful small export businesses in the global marketplace. Alternately humorous, amazing and inspirational, their stories also serve as valuable advice for readers wanting to follow their example and start exporting. The Children’s Bureau Legacy: Ensuring the Right to Childhood (ePub eBook) (US $9.99) shares the 100-year legacy of this landmark agency that established the first Federal Government programs, research and social reform initiatives aimed to improve the safety, permanency and well-being of children, youth and families. It provides a fascinating exploration of the evolution of America and our treatment of children through each Presidential Administration as it covers often inspiring and sometimes heart-wrenching topics such as: ending child labor, the Orphan Trains and the controversial Indian Boarding Schools; adoption and foster care; infant and maternal mortality; Aid to Dependent Children; support of US military families and care of European World War II refugee children; early childhood education Head Start; child abuse and neglect; and much more. To commemorate this tragic event, the Government Printing Office (GPO) is offering a free digitized version of the full, original (and now long out-of-print) Official Report on the Assassination of President John F. Kennedy (PDF) (FREE DOWNLOAD) by The President’s Commission on the Assassination of President Kennedy, known as the Warren Commission. Sort through the evidence, interviews, and facts that were available to the Commission in the ten months following the assassination, and make your own conclusions about the crime and the report’s “single shooter” finding. When you’re looking for the perfect gift this holiday season, spend some time shopping through GPO’s U.S. Government Online Bookstore. And remember, worldwide standard SHIPPING IS FREE on the U.S. Government Bookstore website, so shop away! After all, there’s enough there to stuff a sleigh (or a million dreidels ;-). How can I obtain these 12 Bargain Books? Shop Online: You can purchase these publications from the U.S. Government Online Bookstore at http://bookstore.gpo.gov by clicking on the links above in this blog post or clicking here to shop all our BARGAINS UNDER $20 publications. ** Brú na Bóinne is a carved stone underground chamber that lights up to show the carvings on the stone walls only on the winter solstice, December 21. About the author(s): Adapted by Government Book Talk Editor-in-Chief and the US Government Printing Office (GPO) Promotions & Ecommerce Manager, Michele Bartram, from an original blog post by Jennifer K. Davis from GPO’s Library Services & Content Management Division that supports the Federal Depository Libraries Program (FDLP). Happy holidays from us both!